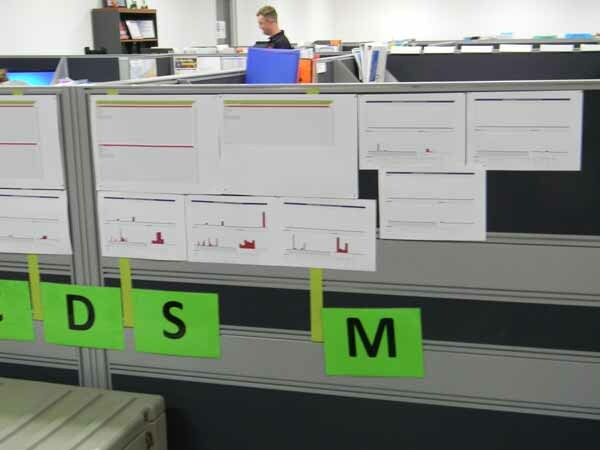 The QCDSM implementation process – an example taken from the QCDSM implementation in The Access Group, Australia situated in Perth and Adelaide. 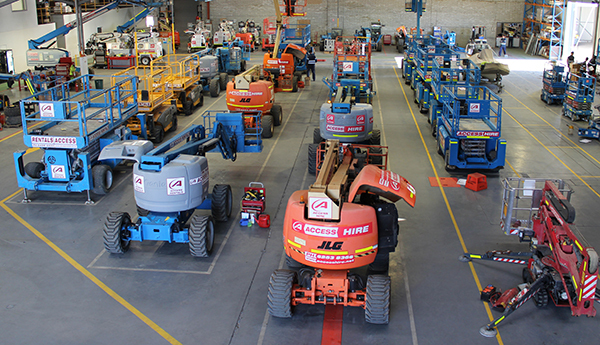 The 3 pictures show the type of equipment they hire out in Australia. The journey began in July 2013. 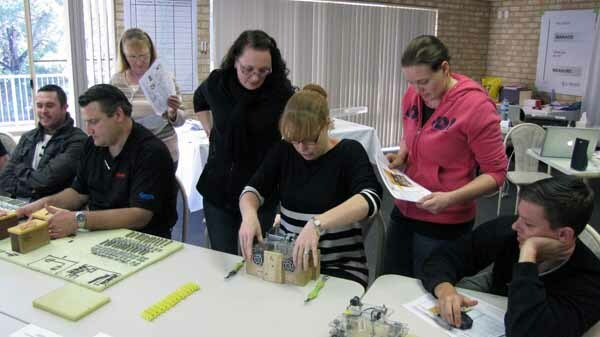 We began by conducting 7 Try Z Seminars for their Perth Headquarters people (see www.qcdsm.com link: ‘Training’). The seminars are the first step in the journey to excellence using the QCDSM system. The reason why we begin with this seminar is to appraise as many as possible in the company of the purpose and function of the QCDSM system. They will learn the importance of working as a team. 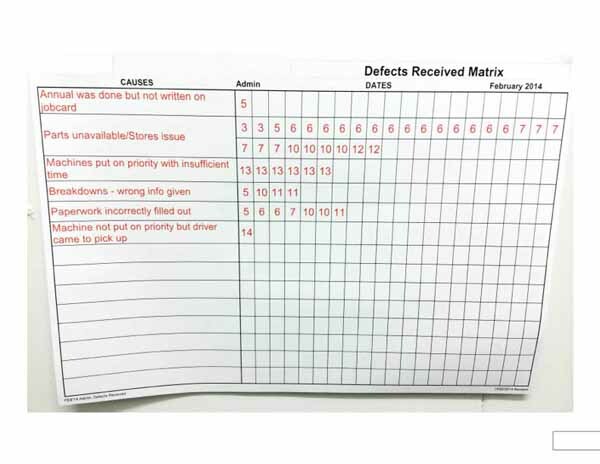 They will, among others activities, achieve remarkable continuous improvement results by developing procedures known as Detailed Process Sheets after measuring the results of their production runs. Learning and experiencing the importance of properly written procedures, properly trained and followed up on is critical to becoming Lean. 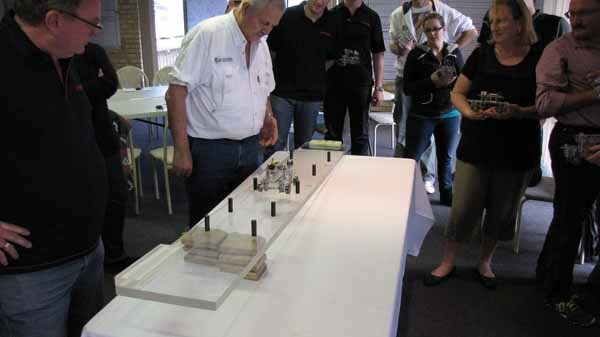 The seminar uses a small plastic and metal component car model to this end. The unit has 68 separate parts including plastic parts and bolts, washers and nuts plus other items like an exhaust tube etc. The object is to develop a process to build this unit to specifications with 0 defects and a production time of 15 units with 6 different operators each run to be between 1000 and 1500 seconds. Power Bar, a company in Boise, Idaho, USA has held the world record since 1999. They achieved 0 Defects in a time of 1066 seconds. The closest to this has been1150 seconds with 0 Defects. It is not about the numbers but to absorb and use the process that will achieve the numbers. This is done using the model car and provides them with the opportunity of producing 15 of these units within productivity, efficiency and quality parameters. Here are a few pictures of the stages. 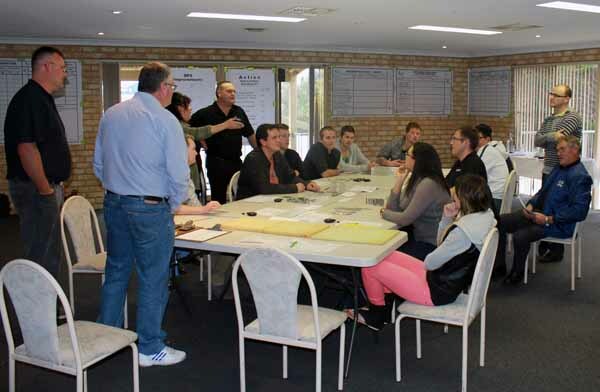 It is also a remarkable team building process allowing them to witness, first hand, how the customer/supplier relationship must work in the supply chain – all very valuable applications to any business – in order to achieve the required results. Planning after the first run. See how they run. Wheel alignment is part of the quality requirements. 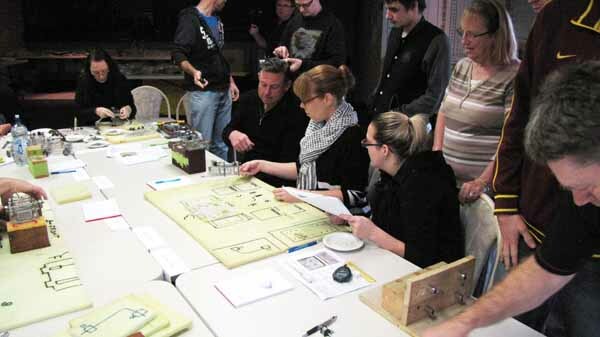 During the seminar the group is required to prepare for 3 production runs of 15 units. 6 different operators are selected for each of the runs. Every aspect of each run is measured and the results displayed on various different charts. Here are just a few examples of the 18 charts used to measure the performance of this unique model. 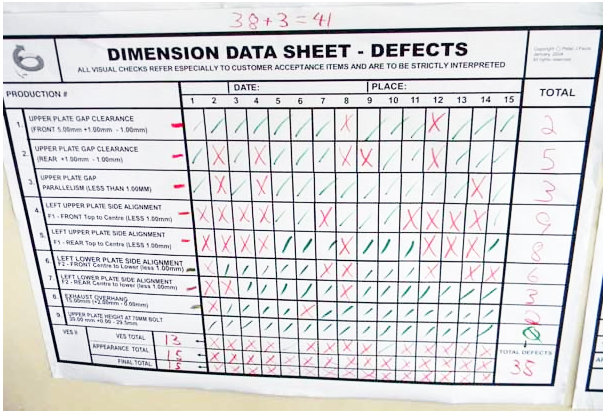 Below is the actual chart used during the seminar and shows their defects pertaining to the Dimension requirements of the unit. 41 total defect. The chart below refers to the Customer Quality requirements – no visual misalignments etc. 83 Defect. We will now show you the overall performance at the end of the seminar and you will see the remarkable improvements made. Remember this group as with all the groups, had not seen or worked with this unit of 68 parts. 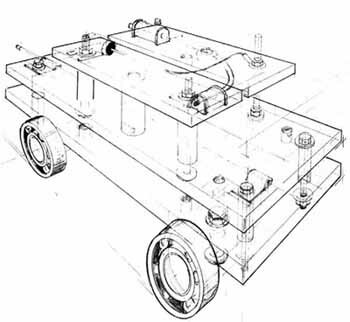 The above two charts measure the required Dimensions when assembling the unit, e.g. height between the plates, overhang of exhaust pipe etc. The Appearance of the unit measures the Customer acceptance items, e.g. proper visual alignment of the various add-ons to the basic unit. This goes to understanding the need for customer quality. 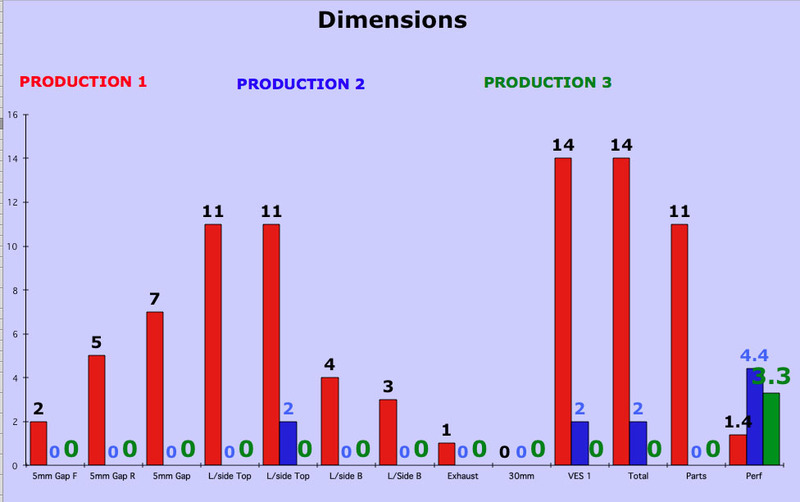 On the Dimension chart (Above left) we see the results after a first production run using a given DPS (Detailed Process Sheet) that was not too accurate. This DPS was compiled from about 10 Try Z seminars many years ago when participants had to write the whole DPS from scratch without the benefit of knowing much about the unit. 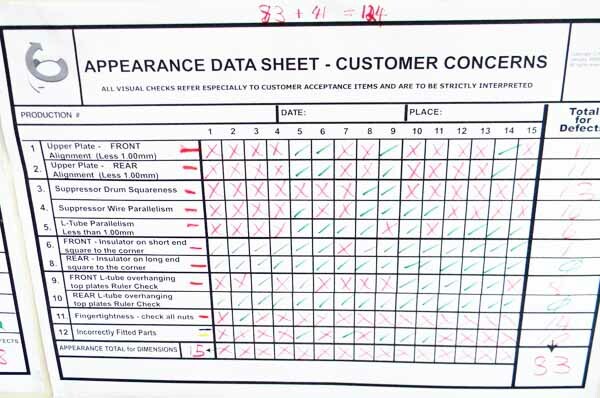 The Appearance chart is introduced to focus on Customer quality and in this initial DPS no attention was paid to visual alignment issues because it was not part of the initial DPS. Hence the sea of red! 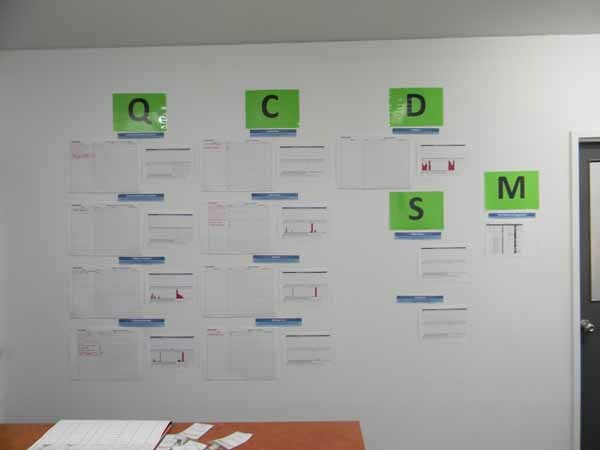 After this first production the task of the group, paying attention to each item measured on the unit from the above charts is to re-write the initial DPS to remove the issues indicated by offering ideas and suggestions for improvement. 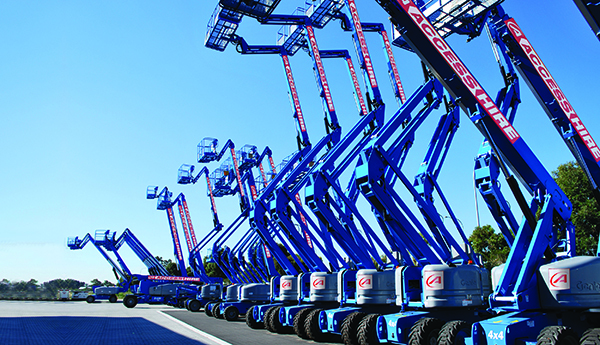 In every case their second run improved their quality dramatically from both Dimensions and Appearance and also improved productivity. No longer can it be said that productivity and quality cannot be improved together. Setting Targets (Above) is very important. The improvement from the standard time set of 3040 with their first time of 2406 to 2003 to 1758. 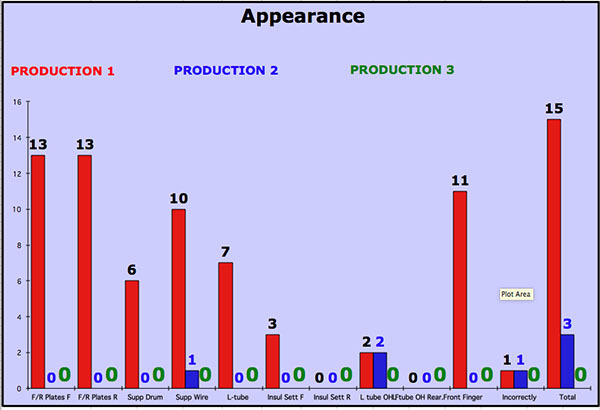 We record the performance of each unit through the production cycle. This will show you how they performed on the line. Above is the standing world record held by PowerBar of Boise, Idaho. Note the improvements: 3331 seconds to 1522 approximately 46%. The Quality (Defects) speaks for itself! Armed with this knowledge and experience, the next step is to transfer this understanding and experience into the real work place. Thus the Green Room Meeting process. This is the structure that is set up in every department throughout the company. 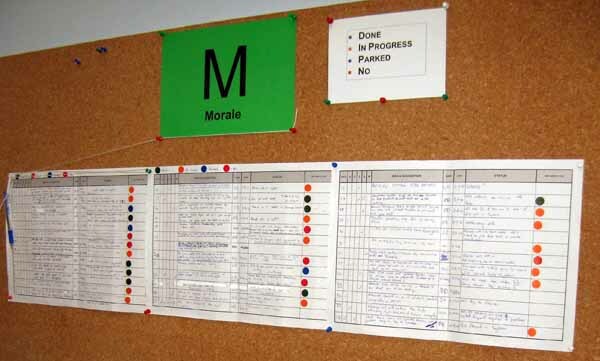 Following the training, the Green Room meetings are systematically and in a standardised way introduced into a department. 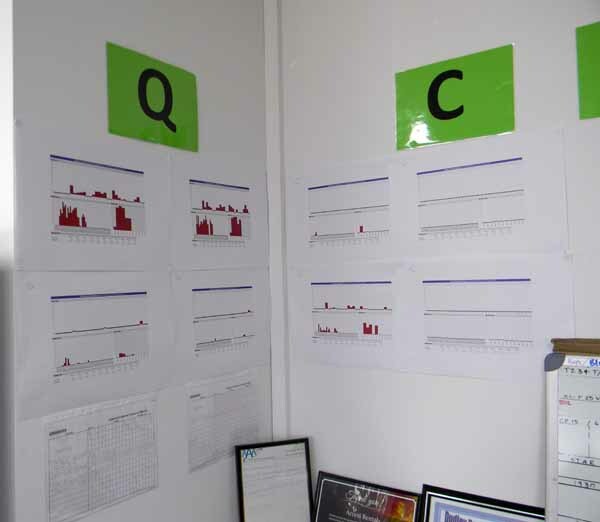 The purpose is to set up charts to visually measure the performance of the departments on a daily, weekly and monthly basis. Five measurement criteria are used: Quality, Cost, Delivery, Safety and Morale (Ideas and Suggestions) measures. Based on the principles – ‘you cannot manage what you do not measure’ and ‘pay attention to detail’ – the Green Room Meetings are designed to transfer the learning from the seminar to real life in the work place. 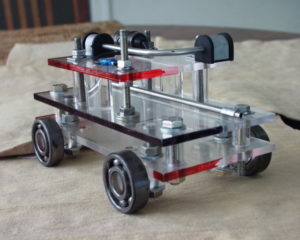 During the Try Z Seminar they achieve remarkable results using a medium they were unfamiliar with – the model car. Ballance Agri-Nutrients, New Zealand. Ballance implemented QCDSM from 2011 to 2013 into their whole company. Their latest Try Z Seminar was held in February 2014. 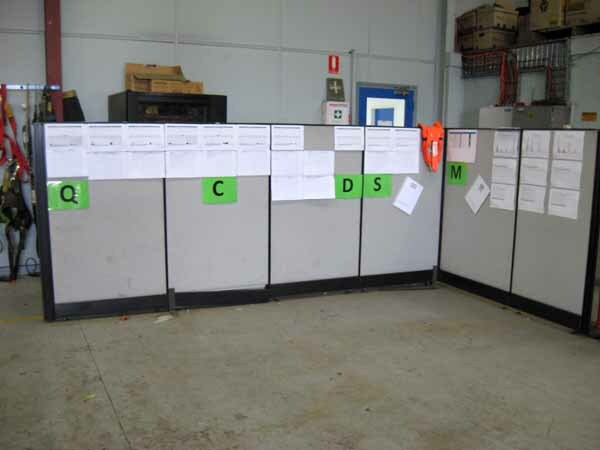 The challenge for applying Lean principles is to know what is happening in your work area. This is why measuring performance is so important and why the people who do the work need to know and see their results. This is why visually charting the measurements in the Green Room process is so important. 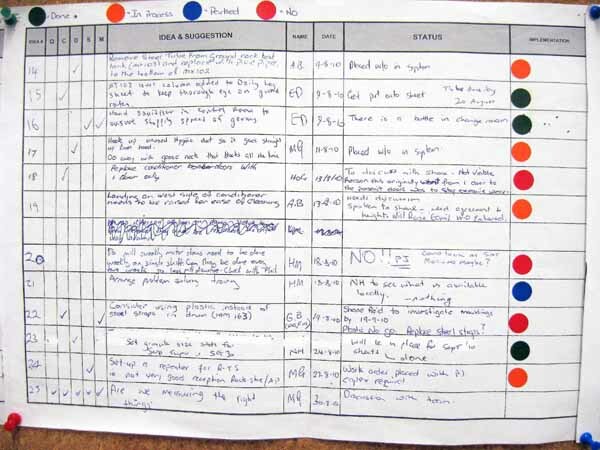 Visually seeing their results is the key to the success of participation and continuous improvement. 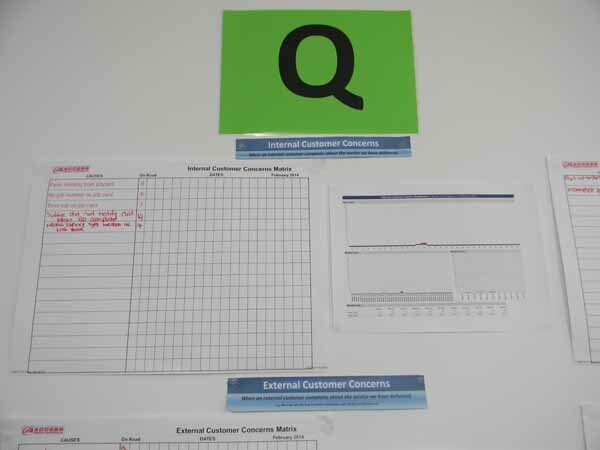 Here are a few examples of the types of charts that the people in a QCDSM process will see on a daily basis. 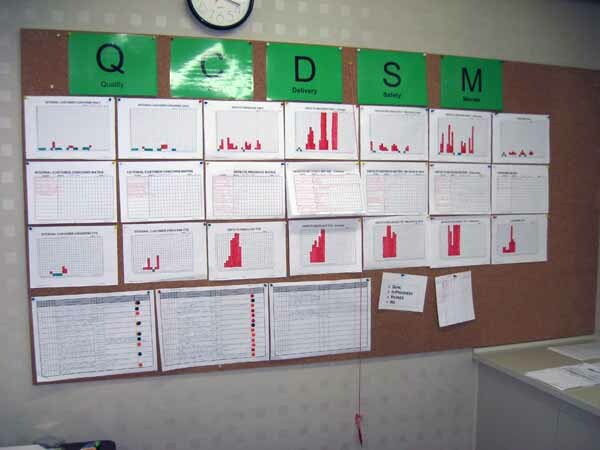 The charts are displayed according to the QCDSM titles. Every Category (Q.C.D.S.M.) has 3 charts – a Daily, Matrix and YTD chart no matter the category. The Daily chart records every issue that occurs each day (I block for each issue in the column.) The Matrix chart – below – itemizes the issues and records on what day of the month they occur shading one block for each occurrence even on the same day.. The YTD (Year to Date) chart records the total of all issues recorded during every week of the month. Under the Quality title, 4 separate categories are used. These are Internal Customer Concerns, External Customer Concerns, Defects Received and Defects Produced. It is not the intention to go into detail in this document. Suffice to say that the training given explains these details. An example of charting from College Park Industries, NY, Prosthetic device manufacturers. A. The top chart is the Daily record. The black columns are the weekend dates. The red lines, of course, issues received – one block per issue. B. 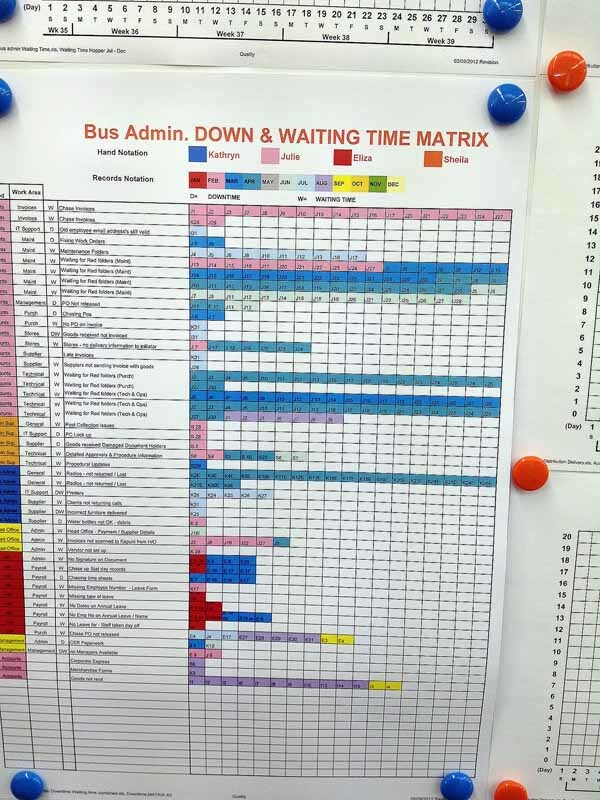 The middle chart is the MATRIX chart – a critical chart to itemize the issues received and to record the dates in the month these issues were received. Another example is shown below. C. The bottom chart is the YTD (Year to Date) chart. It is a summary each week of the year of the number of issues received during the corresponding week. The chart depicted indicates some serious issues prevalent over a number of months. 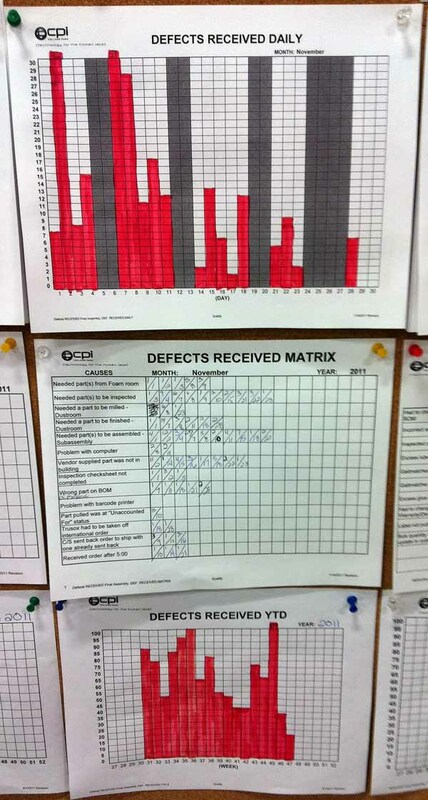 The Matrix chart – see below – is perhaps the most important measurement chart as on this chart the details of each issue and the date on which the issue occurred is recorded and explained. This, then, visually highlights recurring issues. 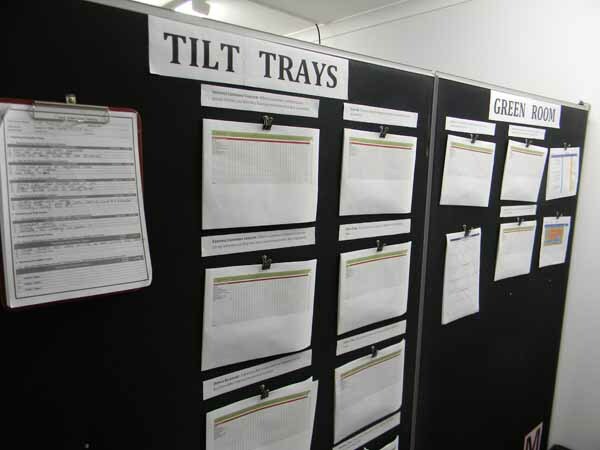 The Matrix charts focus the attention of the people on the issues and how often they have occurred which then provides the people with the opportunity of considering what action needs to be taken. This chart is the discussion-starter as it were, resulting in input from the people of the meeting about the issues – discussion, dialogue. Ideas and suggestions are then given as a result of the discussions that occur based on what is seen. Note in the above Matrix chart: Parts unavailable/Stores issue – reveals what could be a major bottleneck in servicing the equipment. The data is from 1st to 14th February 2014. Obviously item #2 needed immediate attention. Matrix charts can take on many different formats. The example above represents the issues occurring in the same department but from different responsibilities within that department. Using colours and various other means to differentiate issues, a remarkable visual presentation of what needs to be addressed is presented. The 1st Level Green Room meeting is the basis on which QCDSM is built. These meetings monitor and control the business outputs of every department in the company at the base level be they manufacturing or services. However, these meetings need assistance from the overall company structure in order to do their work and it is for this reason that the meeting structure for QCDSM is developed up the organisation. While the leaders of the 1st level meetings can be either the supervisor or one of the employees in that area, the 2nd level meeting and upwards needs to be led by the managers of those departments. 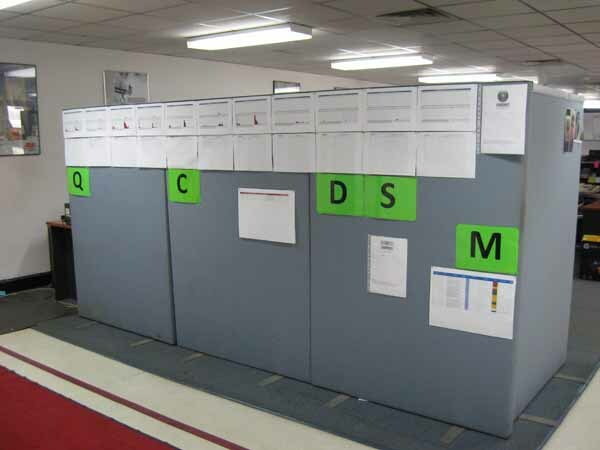 The ultimate purpose of a company using the QCDSM System is to become Lean through continuous improvement driven by employee involvement within their areas and the company as whole. Visually noting their performance is the first step in eliciting from them their ideas and suggestions on how to remedy the issues. This may be in their control or require the services of other departments or experts. But, they are in control. The recording and implementing of the Ideas and Suggestions of the people of the area is key to the success of developing an excellent company. 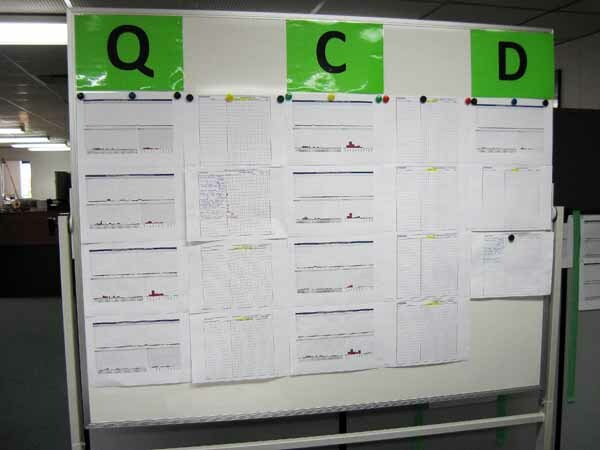 Apart from the tablet used to record the ideas and suggestions displayed as part of the Green Room charts, a database is set up within the company to record and monitor all the ideas and suggestions and their implementation progress. Here is an example of the tablet displayed on a typical Green Room wall. The Green indicates that the idea has been implemented. Yellow, in process and Red, not implemented for explained reasons. Initially, the tablet is used to record the first ideas and suggestions. Each week the data on the tablet is entered into the database. The department prints this out in A3 size and displays it on the wall. New ideas the next week are then added manually until at the end of the week the process is repeated. The database for the ideas and suggestions sets up a record for the company to assess the continuous improvements being made. It is also extremely important for management to ensure that ideas given are attended to. Not paying attention to ideas and letting them accumulate on the tablet is the surest way to forfeit the participation of the people. Above is an example of a database for ideas and suggestions. Regularly, if not daily, inform the people of the progress of their ideas and suggestions. Not to do so will jeopardise the whole process. The Internal Customer Concern/External Customer Concern database can take many forms. In the example below the database is used only if the issue is not resolved within 48 hours. It is entered into the database for follow up. Here is an example of what a database can look like. 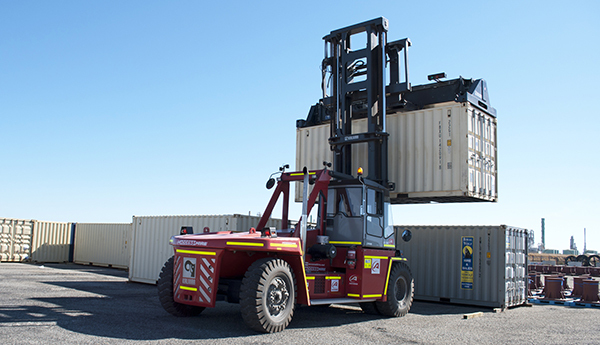 This database provides the company with invaluable data to recognise and begin to resolve the issues that are creating bottlenecks, customer concerns and other problems within the supply chain. By measuring the issues in the Green Rooms and escalating them if not resolved after a certain period, enables the 2nd and 3rd level meetings to utilize this information to allocate resources and help to smooth-out the supply chain process. Our book, THE NEXT STEP is available in US Size as a printed booklet available from www.lulu.com and also in pdf format in A4 size. This is available to distribute following an arrangement with QCD System. . Please contact us if you are interested in purchasing it. 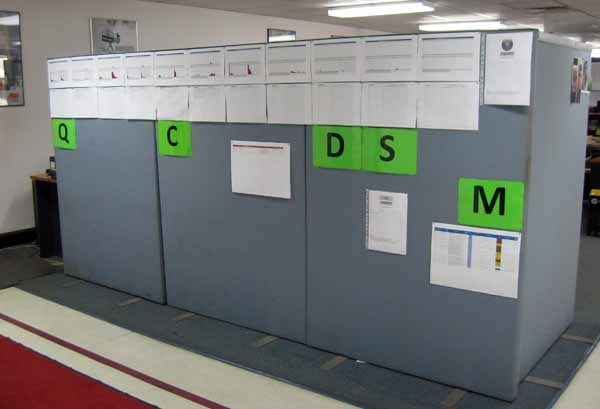 It is an excellent companion to use to monitor and maintain the QCDSM process.